1. 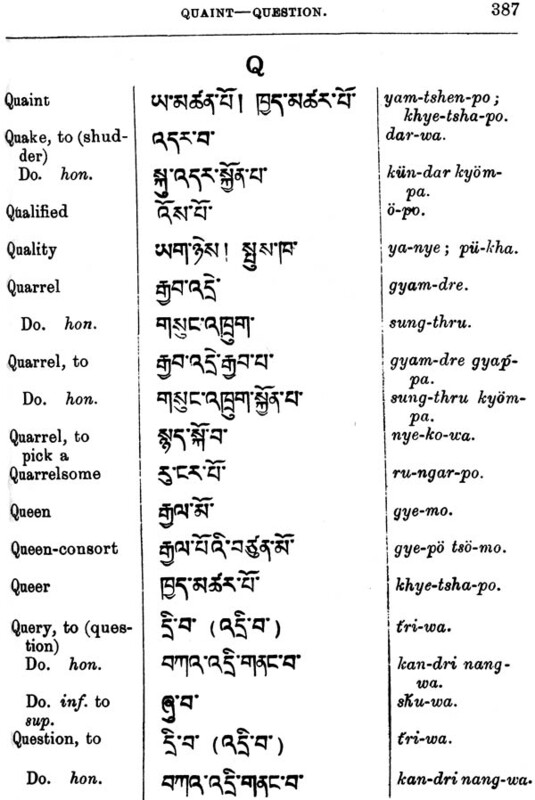 In the first edition this dictionary was published as the second part of a "Manual of Colloquial Tibetan," the first part consisting of a Grammar of Colloquial Tibetan. In this second edition both parts have not only been revised, but have also been considerably enlarged. The map accompanying this edition-the latest from the Indian Survey Department-is bulkier than the Royal Geographical Society's map of 1904, with which the first edition was furnished. It has therefore been found best to bring out the Grammar and Dictionary as separate books. The map accompanies the Grammar. 2. 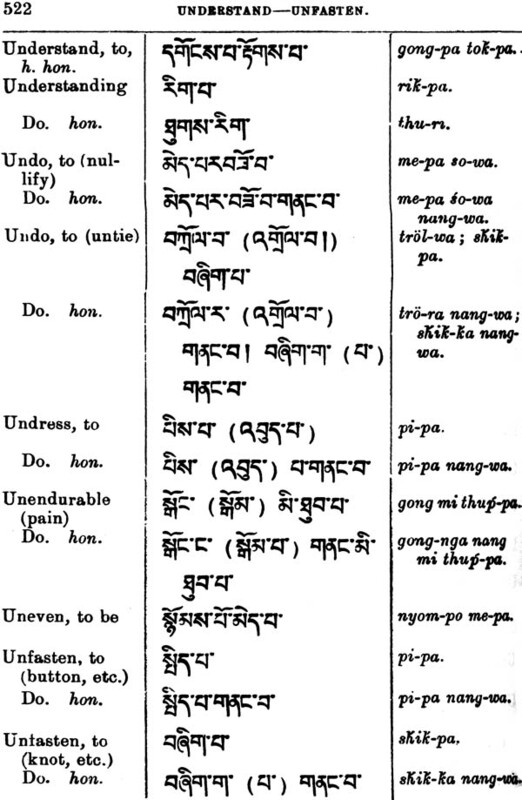 The Tibetan words are Romanized, as in the first edition, for the convenience of those, who lack either the time or the inclination to master the Tibetan character. 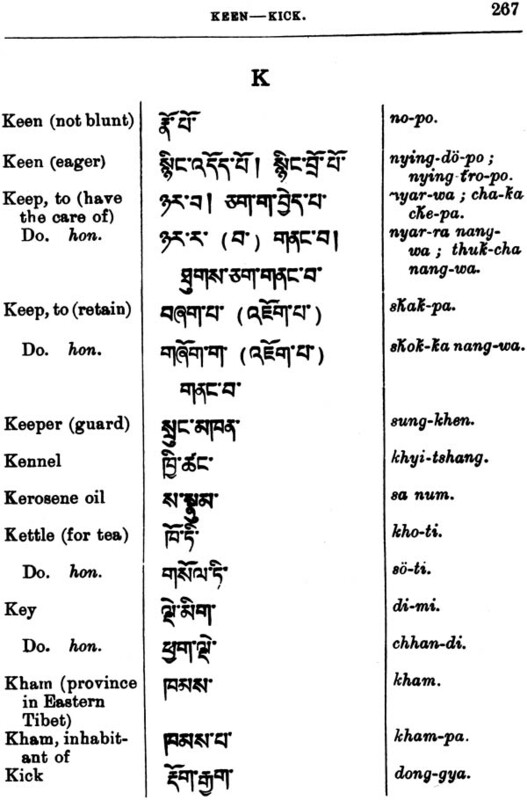 But the first Chapter of the Grammar, that on "The alphabet and its pronunciation," is reprinted at the commencement of this dictionary, in order that the student, who learns the Tibetan letters, may understand the structure and the pronunciation of the words more clearly than can be expressed by any system of Romanization. 3. Some two thousand fresh words have been added in this edition, which now contains between eleven and twelve thousand words. As Political Officer in Sikkim,-a post to which I have recently been recalled, though I retired from the service of Government ten months ago,-I am in charge of the diplomatic relations of the British Government not only with Sikkim, but with Tibet and Bhutan also. 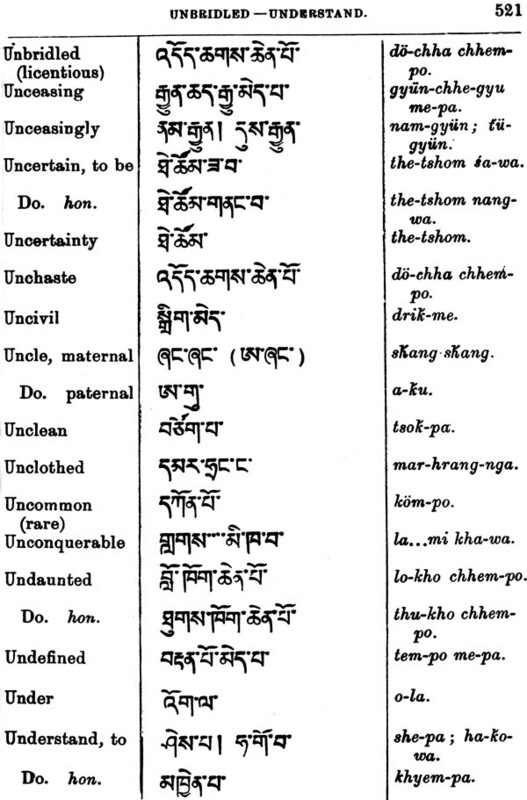 Many therefore of these new words, as well as the revision of a few in the earlier edition, have been gained in conversation with my Tibetan friends of all classes, High Priests, Cabinet Ministers, civil and military officers, shopkeepers, mule-drivers, shepherds, peasants, etc., etc., during my fifteen years' service in Tibet and on the borderland. Among all these my thanks are especially due to Rai Sahib Kusho Pahlese of the noble family of Pahla in Lhasa. And Mr. David Macdonald, British Trade Agent at Yatung, Tibet, has again rendered valuable assistance. 4. My acknowledgements are also due to the Government of Bengal, who have defrayed the cost of this edition also, in return for its copyright. 5. This book has been adopted as one of the text-books in the High Proficiency examination in the Tibetan language, held under the auspices of the Government of India. 6. In conclusion I must express my pleasure at finding that a second edition was called for owing to the first edition being sold out,-a rare occurrence among books on Tibet,-for it may be hoped that some have found it useful. Preface to First Edition of Manual of Colloqui'al Tibetan." 1. The object of this little work is to provide a practical handbook for those who wish to acquire a speedy knowledge of Collequal Tibetan. It, therefore, does not deal with the written language, which differs widely from the colloquial, and is useless for conversational purposes. 2. Notwithstanding the political and commercial importance of Tibet it is remarkable that so few Europeans are able to converse with the people in their own tongue. The language is undoubtedly a hard one to acquire on account of the complexity of the grammar, the intricacy of the spelling, the fine shades of pronunciation, the different terminology, known as the honorific, employed in addressing the higher classes, the variety of dialects, and the distinction, already noted, between the literary and spoken language. To minimize these difficulties an to make the approach to the colloquial as easy as possible, is the aim of this handbook. 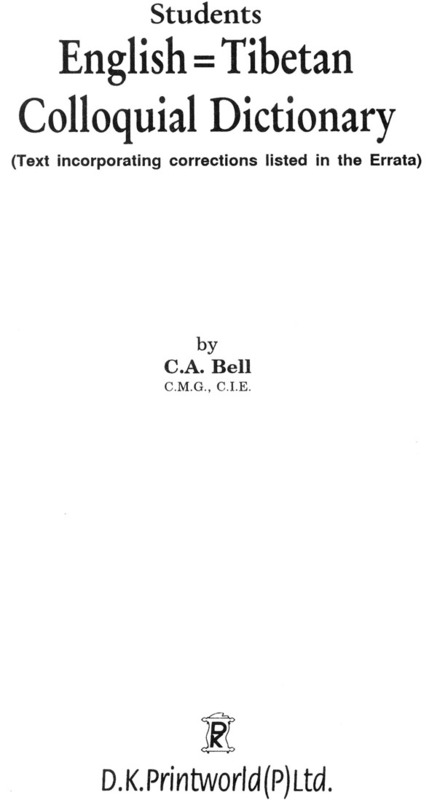 It seeks to do so by giving a minimum of grammatical notes, fully explained by examples, a clear statement of the rules of pronunciation, a simple system of phonetic spelling in the Roman character, a set of conversational exercises and a sufficiently full vocabulary of both common and honorific words to meet the ordinary requirements of conversation with all classes. Every lama his own doctrine." Under these circumstances it was necessary to select the dialect most widely spoken, and that of Lhasa has been chosen accordingly. It is not only the dialect of the Central Province, but may be said to be also the lingua franca of the whole of Tibet. It is more generally spoke than any other, and is recognized as the most correct form of speech by all. 4. 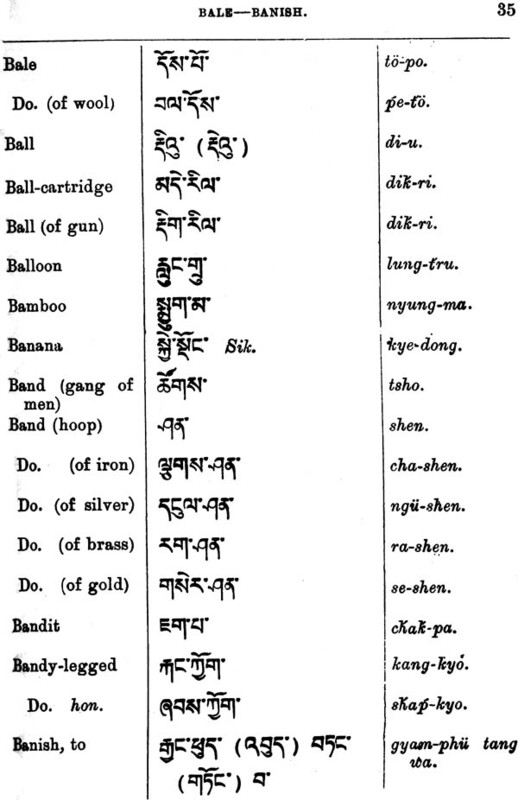 The Vocabulary contains somewhat less than ten thousand Tibetan words, the number of separate English words being some seven thousand or about twice as many as those contained in any colloquial Tibetan vocabulary up to date. The remaining three thousand words are made up of about two thousand honorific words and one thousand extra Tibetan words. 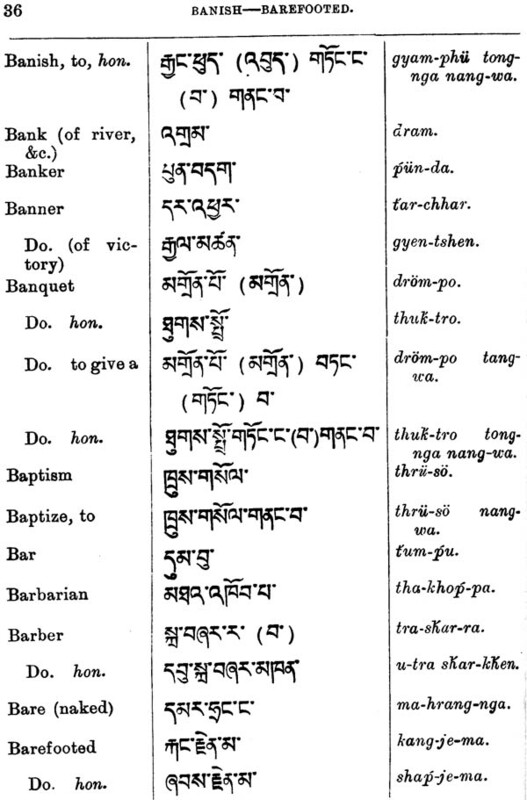 Where two or more "Tibetan words are given for one English equivalent, all are in common colloquial use and the one placed first is the commonest. It is hoped that the honorific words given may be found useful. Existing vocabularies give but few. 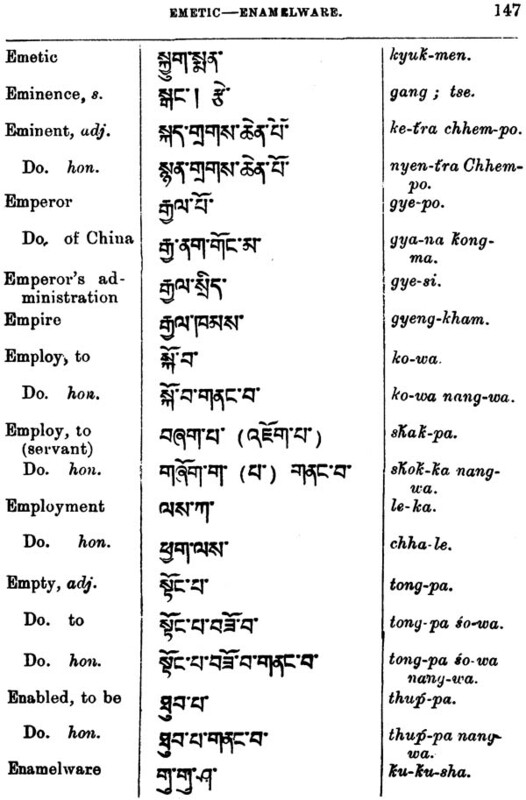 A knowledge of honorific words is essential for talking to or of Tibetans of good position. It is hoped also that the exercises in Tibetan handwritings given in Part I, Chapter XVII, may assist any student, who so desires, to learn how to write Tibetan letters and other documents in a clear and correct style. 5. It is recommended that the grammar be used as follows: The rules of each Chapter should be perused and their accompanying examples learnt by heart. The Words at the end of the Chapter should then be committed to memory as far as possible, and the exercise (for reading and copying) should be read aloud to the teacher to ensure correct pronunciation, and every word should be understood. After this the other Exercise (for translation) should be translated viva voce and then written down, care being taken, when writing, to verify the spelling, as very few Tibetan teachers can spell correctly. 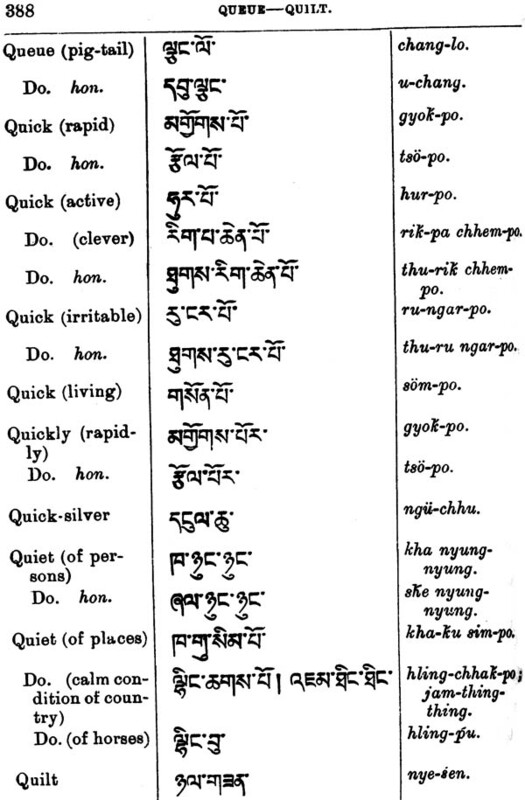 On the following day the Tibetan half of the reading exercise should be covered up, and the English half re-translated into Tibetan, first viva voce and then in writing. If the above plan is followed the student will gain the soundest possible knowledge of the language. But if the student has not time for the above thorough system, he should omit the writing of both exercises and limit himself to the viva voce. 6. As regards teachers it is best to obtain at first one who speaks English. 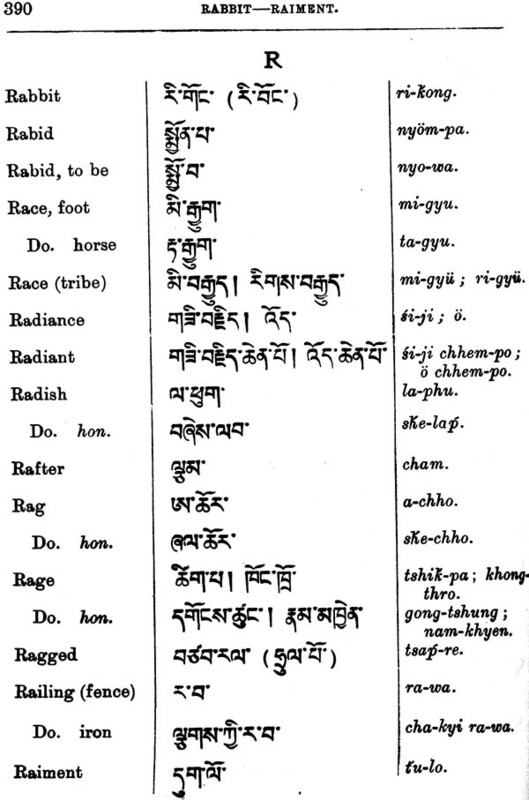 If the teacher can speak the Lhasa language also, so much the better, but very few of the English-speaking Tibetans in the Darjeeling district or in Sikkim are really proficient in the latter. As soon as he can converse a little, the student should change to a Lhasa man that speaks Tibetan only, so as to be certain of always speaking in Tibetan. When the teacher knows English or Hindustani there is always a tendency for the conversation to drop into the latter languages. The Lhasa teacher should of course be as well educated a man as is procurable. The student should also, when he is able to understand and converse a little, call in Tibetans of the Lhasa province to talk to him, one at a time, changing them every two or three weeks. Tibetans are generally ready to talk; they have not the formal constraint of manner which characterizes so many of the Indian races. The more he calls in thus, the better will he be able to understand and reply to any chance Tibetan he meets. 7. A word as to the system of Romanization. 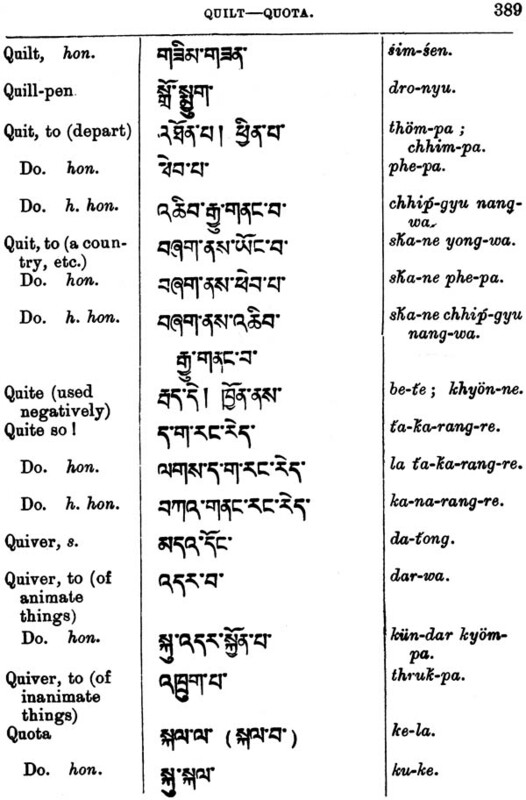 In this, which is believed to be as phonetic as possible, I had reluctantly to differ from the various systems of my predecessors, as none of them seemed to me to reproduce the sounds in the dialect of Lhasa, though some reproduced those in the Sikkimese and other dialects. The system followed in this book is nearly the same as that recommended to Government for official reports, etc., by Captain O'Connor, C.I.E., Trade Agent at Gyangtse, and the author, but distinguishes the different sounds with greater accuracy than was considered necessary in the Government system. 8. 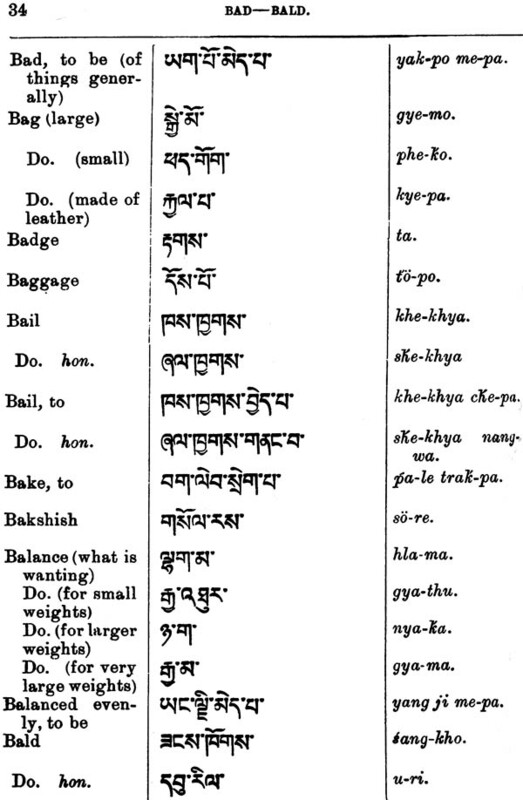 The Tibetan words and syllables in brackets are those used in the simple form of book-language. Where the pronunciation of the literary and spoken form of a word is the same, the literary form alone is given, since the sole object of entering the spoken form is to show the exact pronunciation of the word. 9. In conclusion, I must acknowledge my obligations to the Government of Bengal for their patronage, to the Grammars of the Rev. Graham Sandberg, the Rev. H.A. Jaschke and the Rev. 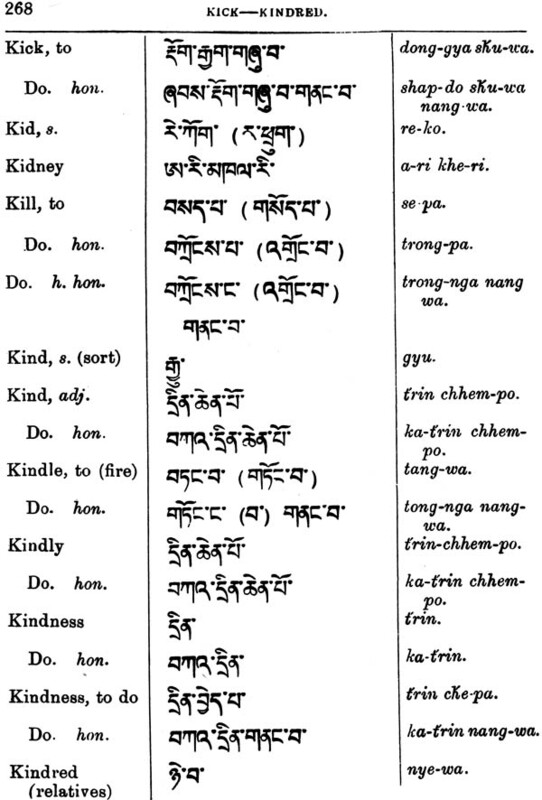 Father A. Desgodins, and especially to Mr. Henderson's Tibetan Manual, which marks a great advance in the Tibetan colloquial over any of its predecessors. And most of all are my thanks due to Mr. David Macdonald, who has revised this book throughout, and to whose unrivalled knowledge of both colloquial and literary Tibetan are largely due whatever merits the work may possess. 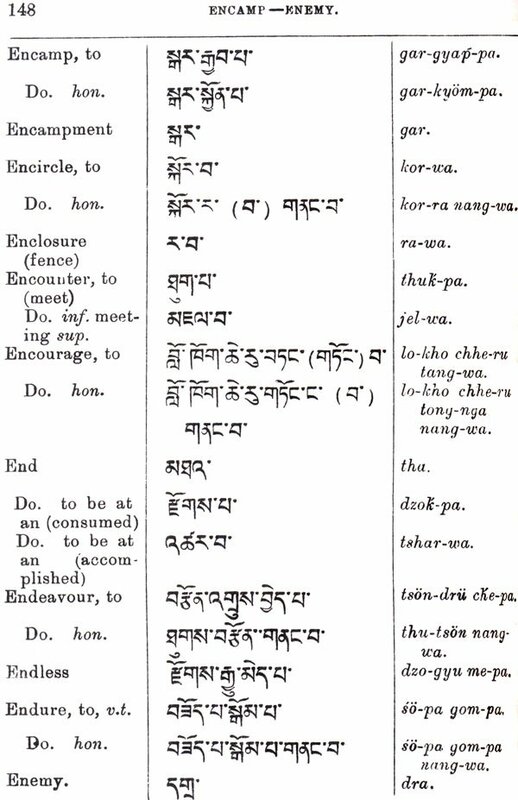 The Dictionary is a practical handbook that attempts to provide a quick yet thorough understanding of the colloquial Tibetan language. 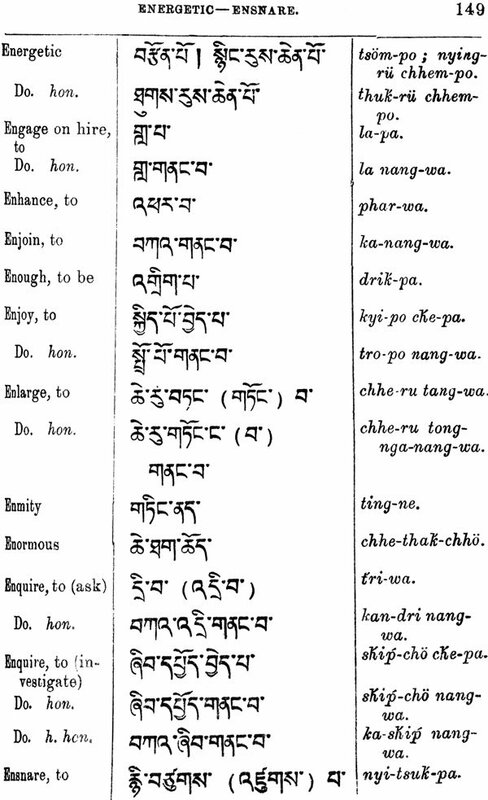 A special feature of the Dictionary containing more than eleven thousand words including honorific words, is that the Tibetan words are presented in romanised form for pronunciation by those who do not understand Tibetan. 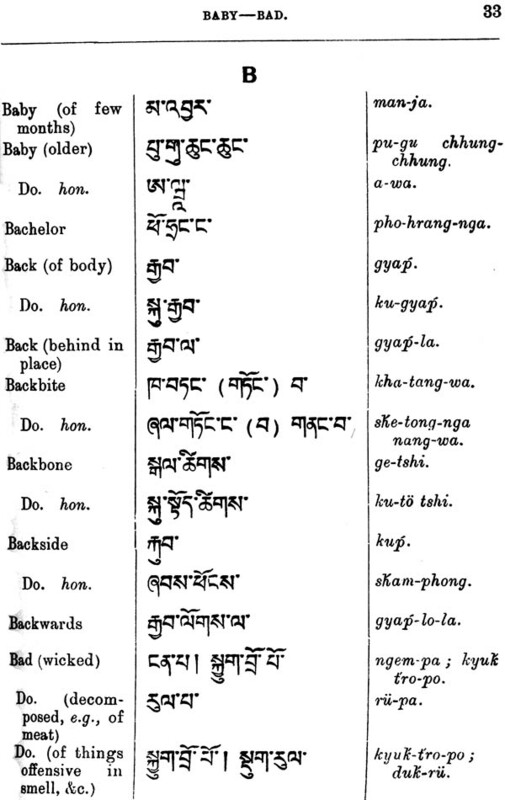 An introductory chapter details the structure and system of pronunciation of Tibetan letters and words. 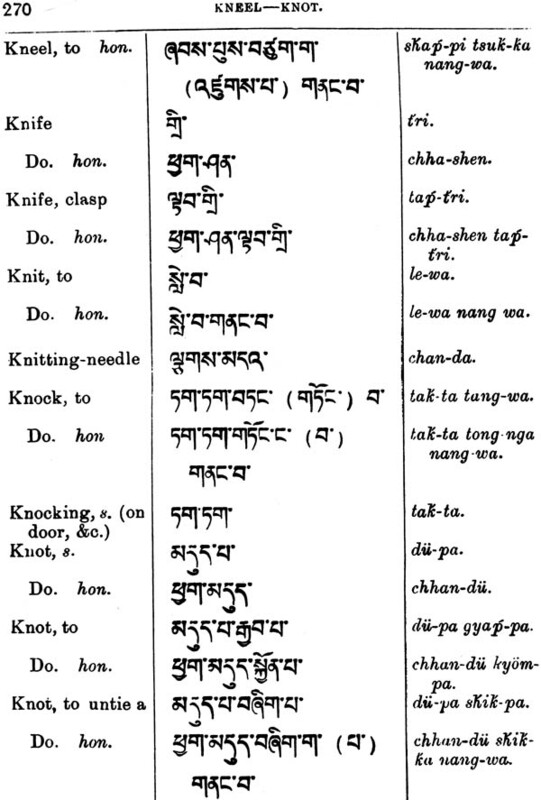 It combines an easy approach with incorporation of features like two or more Tibetan words against the same English equivalent and the literary form in the Tibetan character, with the colloquial from in the romanised Tibetan, when the colloquial and Tibetan forms differ from each other to some extent. All this is to aid in a deeper knowledge of the subject. A special feature of this edition is that all the corrections listed in the errata of the second edition have been carried out in the main text. The volume will be particularly useful to scholars of Tibetan language and English-speaking students learning the language. 1. 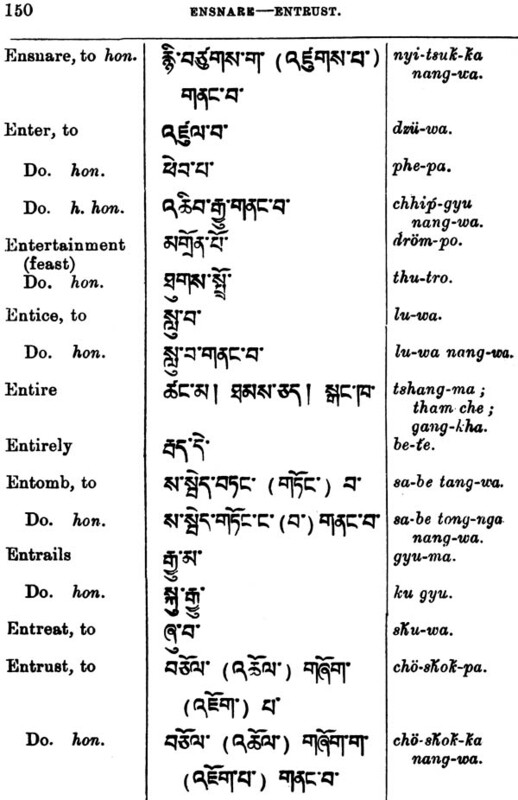 In the first edition this dictionary was published as the second part of a "Manual of Colloquial Tibetan, "the first part consisting of a Grammar of Colloquial Tibetan. In this second edition both parts have not only been revised, but have also been considerably enlarged. The map accompanying this edition- the latest from the Indian Survey Department –is bulkier than the Royal Geographical Society's map of 1904, with which the first edition was furnished. It has therefore been found best to bring out the Grammar and Dictionary as separate books. The map accompanies the Grammar. 2. 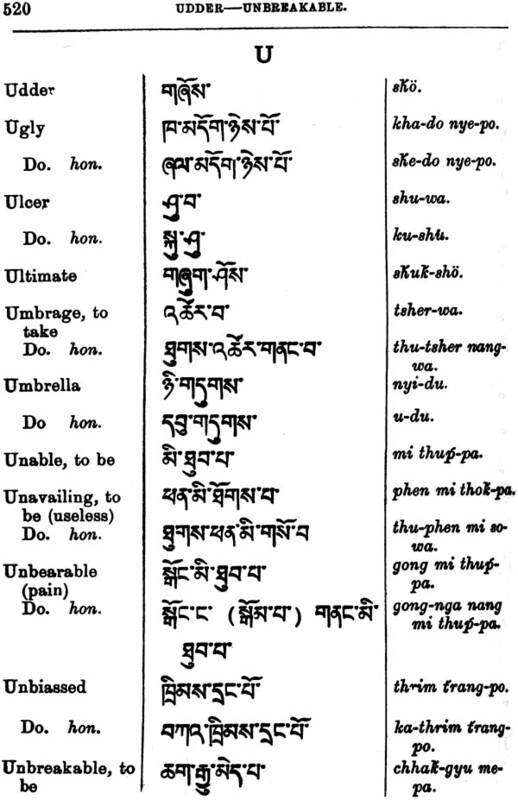 The Tibetan words are romanized, as in the first edition, for the convenience of those, who lack either the time or the inclination to master the Tibetan character. 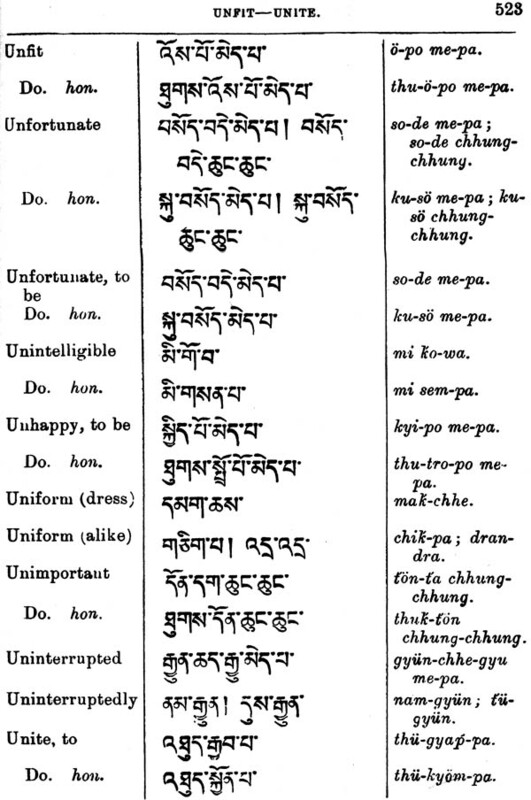 But the first Chapter of the Grammar, that on "The alphabet and its pronunciation" is reprinted at the commencement of this dictionary, in order that the student, who learns the Tibetan letters, may understand the structure and the pronunciation of the words more clearly than can be expressed by any system of Romanization. 3. Some two thousand fresh words have been added in this edition, which now contains between eleven and twelve thousand words. As Political Officer in Sikkim, - a post to which I have recently been recalled, though I retired from the service of Government ten months ago,- I am in charge of the diplomatic relations of the British Government not only with Sikkim , but with Tibet and Bhutan also. 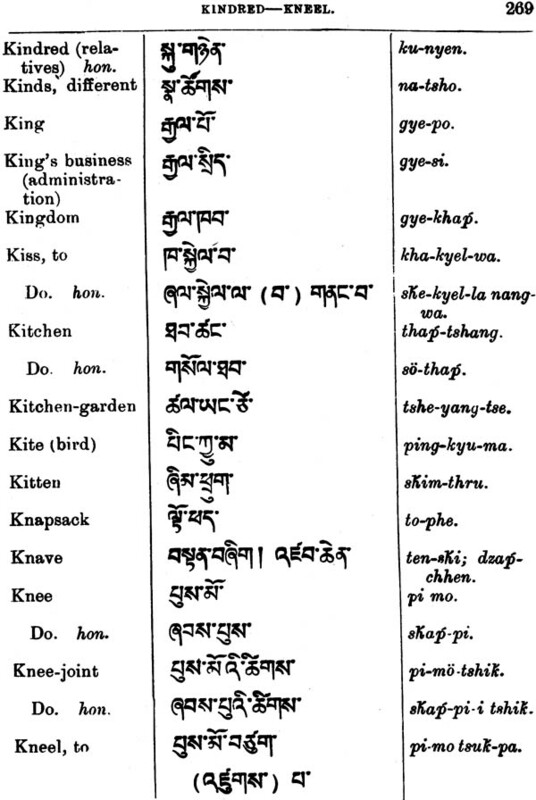 Many therefore of these new words, as well as the revision of a few in the earlier edition, have been gained in conversation with may Tibetan friends of all classes, High Priests, Cabinet Ministers, civil and military officers, shopkeepers , mule-drivers, shepherds, peasants, etc. , during my fifteen years' service in Tibet and on the borderland. Among all these my thanks are especially due to Rai Sahib Kusho Pahlese of the noble family of Pahla in Lhasa. And Mr. David Macdonald, British Trade Agent at Yatung, Tibet, has again rendered valuable assistance. 6. In conclusion I must express my pleasure at finding that a second edition was called for owing to the first edition being sold out, - a rare occurrence among books on Tibet, - for it may be hoped that some have found it useful.